Q: What does QSC stand for? A: Quilter Sound Company. The founders are Pat Quilter, Barry Andrews and John Andrews. 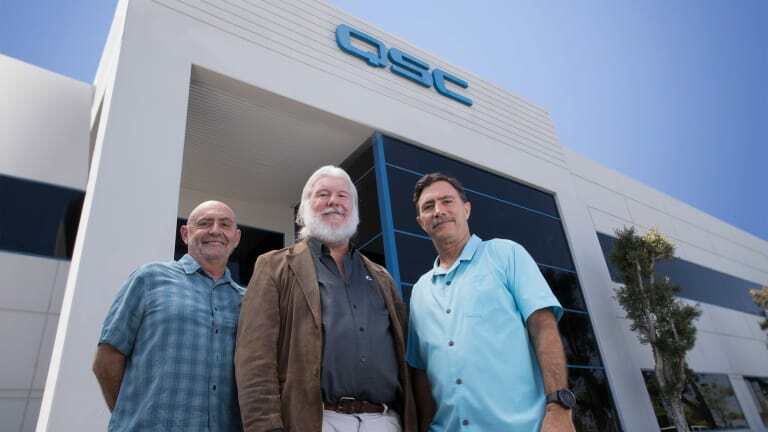 QSC founders, from left, Barry Andrews, Pat Quilter and John Andrews. Q: What kind of products can you find at QSC.com? A: We design and manufacture power amplifiers, speakers, digital mixers and audio/video control systems for the professional audio, IT and cinema markets. Q: How long has QSC been in business? A: This is our 50th Anniversary. The company was founded in 1968. Happy birthday to QSC, now 50 years old! Q: Are you doing anything special for the 50th anniversary? A: We are celebrating with parties at various trade shows and holding a company-wide event centered around the slogan “50 Years and Forward” which acknowledged our 50 years in business while at the same time looking to the future. Q: How can future customers find you? A: QSC, Costa Mesa, CA or visit www.qsc.com and our social media is on Facebook: @QSCaudioproducts, Instagram: @qscaudio and Twitter: @qsc.